I always toss oranges into a salad or peel and eat them plain. Why? I have no idea. Albert Einstein said the definition of insanity is doing the same thing over and over and expecting a different result. Well, I finally decided it was time to stop the insanity and actually achieve a different result. An orange DESSERT was in order! Unfortunately, I didn’t have any oranges on hand! 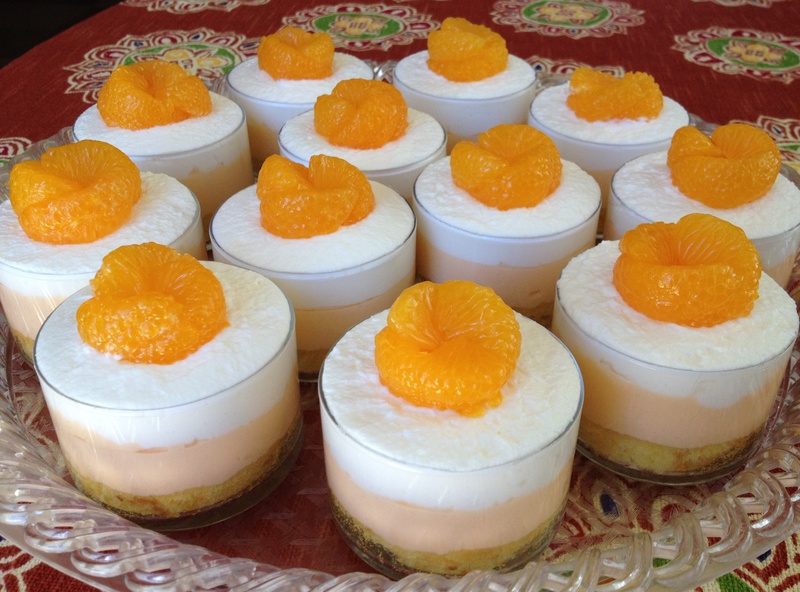 But I did have canned mandarin oranges in the pantry so decided to use them for my dessert. They turned out just fine. The really nice thing about canned mandarin oranges is they’re very uniform in size with almost no broken segments. Best of all, opening a can is way easier than peeling a bunch of oranges and separating the segments yourself. This dessert is best made the day before you plan to serve it because of the time you need to spend chilling the different layers. 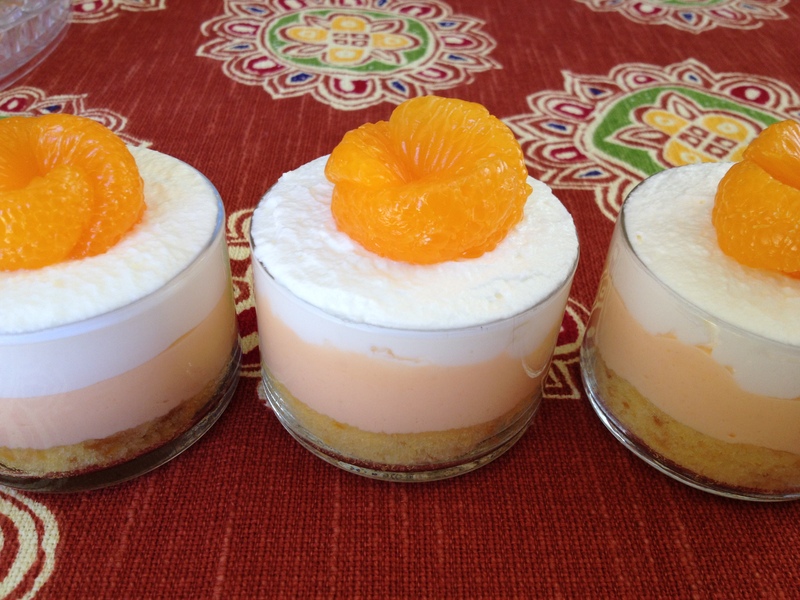 Place cans of mandarin oranges in refrigerator to chill while you work with the cake. Slice pound cake into twelve ½-inch thick slices. Using one of your ramekins or a round cookie cutter, cut a cake circle the same diameter as your ramekins from each slice of cake. Depending on how large your ramekins are, you may only be able to get one whole circle per slice of cake. Press each cake circle into the bottom of a ramekin. Feel free to patch together cake pieces if you don’t mind not having a whole cake circle on the bottom of your dessert. In a large bowl, stir jello and boiling water together for 2 minutes until gelatin is completely dissolved. Open cans of mandarin oranges and drain juice into a 1-cup measuring cup. Stir chilled juice into hot gelatin. Refrigerate gelatin for 40 minutes or until slightly thickened. Remove from refrigerator and whisk in 4 cups cool whip until well blended. 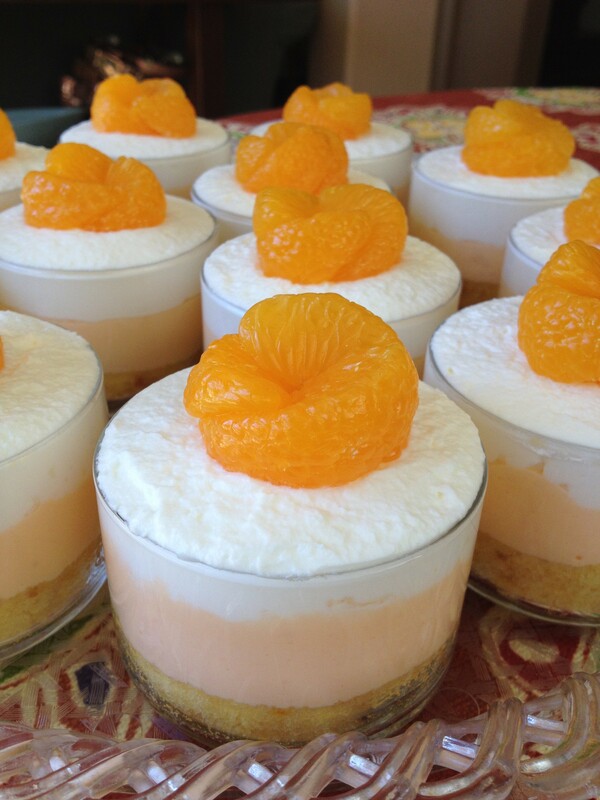 Divide orange mousse evenly over cake in ramekins. Top each with a layer of plain cool whip. Decorate top with orange slices. I arranged 3 mandarin slices to look like a flower. I needed a side-dish to take to a barbecue. Well what could be better than cornbread and a veggie salad? Enter Cornbread Trifle. This recipe has a lot of my favorite components for barbecue side dishes. 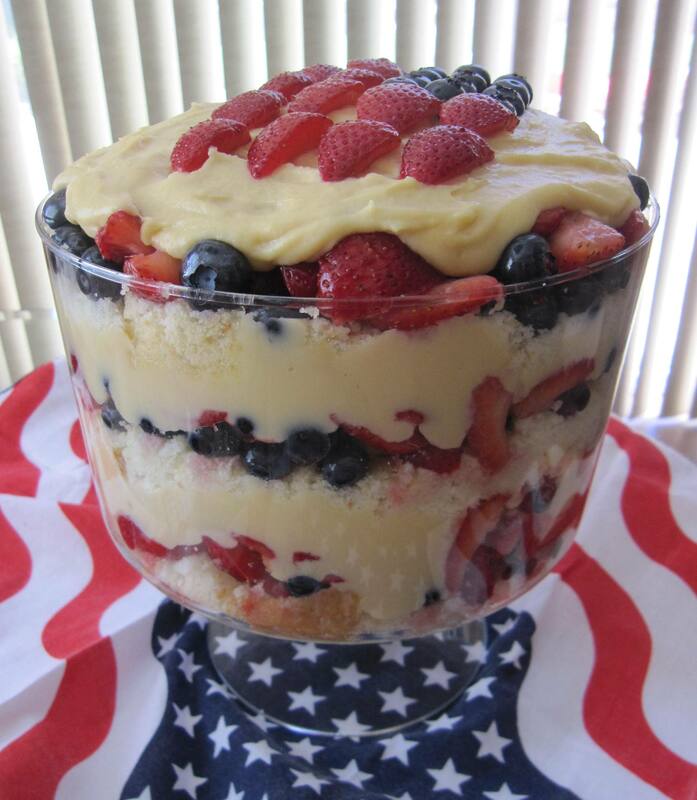 Plus it looks so beautiful all layered up in your trifle bowl. It’s guaranteed to wow everyone with its gorgeous looks and just wait till you taste it! It’s a guaranteed crowd pleaser for sure! This recipe makes a lot so you’ll need a large trifle bowl. Otherwise, be prepared to have some leftover veggies (which are great tossed with chopped lettuce and ranch dressing the next day). Preheat oven as per package directions and grease an 8 or 9-inch baking pan. Cut off the stem end of the jalapeños, then remove the inner membrane and seeds. Prepare batter following the directions behind the box, but replace the milk with sour cream to make the cornbread moister. Add ¼ cup milk and the minced jalapeños to the rest of the ingredients for the cornbread batter. Bake according to the time and temperature directed on the package. Turn out onto wire rack and allow to cool completely. Cut cooled cornbread into approximately 1-inch cubes. Lay the bacon slices on a foil covered sheet pan. Bake at 400ºF for 15 minutes or until brown and crispy. Transfer bacon to a paper towel-lined plate to drain and cool. Stack the crispy bacon and cut them into ½-inch pieces. Set aside ¼ cup of bacon pieces for garnish. Place the mayonnaise and ranch dressing in a bowl. Whisk together until smooth and well blended. In a bowl, combine tomatoes, bell peppers, onion, corn, black beans, and cilantro. Place half the cornbread on the bottom of a large trifle bowl. Press down lightly. Top with half the veggies. Then half the bacon. Don’t touch the ¼ cup you reserved for garnish. End with half the dressing. Repeat the layers a second time ending in dressing. Garnish the top with the green onions and reserved ¼ cup bacon. Chill in refrigerator at least an hour before serving. 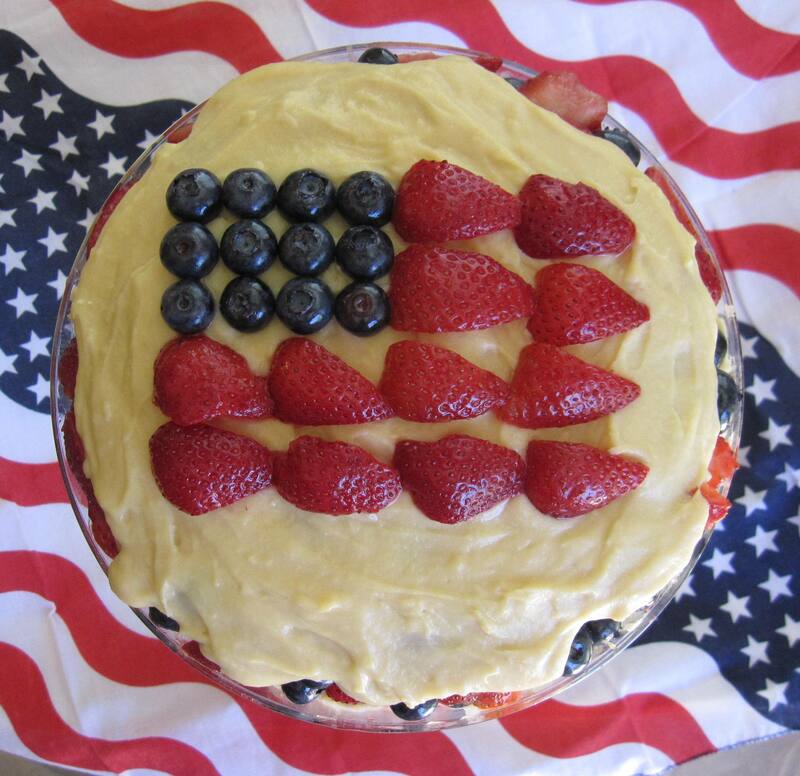 I wanted to come up with a new red-white-and-blue dessert for our 4th of July Barbecue this year and thought it would be nice to make individual little trifles. My daughter, Bashful, helped me with these. She’s becoming quite the little sous chef. These trifles are easy to make because there’s very little baking involved which is perfect for this hot summer weather. I did bake the graham cracker crust, though if you don’t feel like baking it, you could very easily use the crust unbaked. If you want to decorate the trifles with puff pastry stars like I did, those don’t require much more than 10 minutes of baking time either. I made these in little shot glasses, but you could use little mason jars, small disposable clear plastic cups, or any other small, clear containers you have that would show the red, white and blue layers. If your strawberries aren’t very sweet, sprinkle them with a little powdered sugar before assembling. 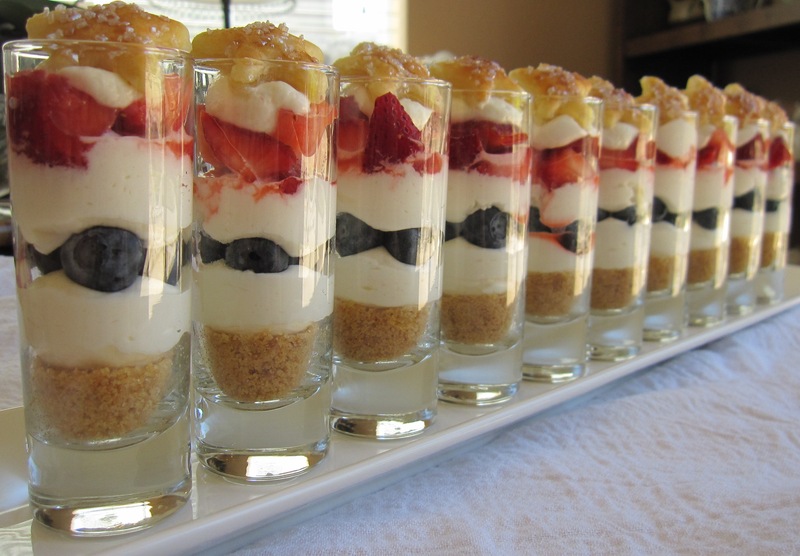 Also, depending on how many mini trifles you’re making, you could end up with extra graham cracker crust. I just use it to make a pie. With a fork, combine the graham cracker crumbs, melted butter and sugar together. Press the mixture into the bottom of a baking pan. Bake for 6-8 minutes or until crust begins to brown at the edges. Combine the graham cracker crumbs, melted butter and sugar together with a fork. Place about a tablespoon of mixture into bottom of each shot glass and press down with the handle of a wooden spoon. With an electric mixer, beat the whipping cream until soft peaks form. Add 1/3 of a jar of lemon curd and continue to beat until well-combined. Taste the mousse and see how you like it. If you want it more lemony, beat in more lemon curd, a tablespoon at a time, until it tastes the way you want it. Take the baked and cooled graham cracker crust and crumble it up with a fork. If you’re doing the no-bake crust, you can skip this step. Place about a tablespoon of crumbled graham cracker crust into the bottom of your shot glass and press it flat with the handle of a wooden spoon. Place lemon mousse into a piping bag and pipe a layer of mousse over the crust. Sprinkle some blueberries over the lemon mousse. Pipe another layer of lemon mousse over the blueberries. Sprinkle chopped strawberries over the lemon mousse. Pipe a little dollop of lemon mousse right on top. 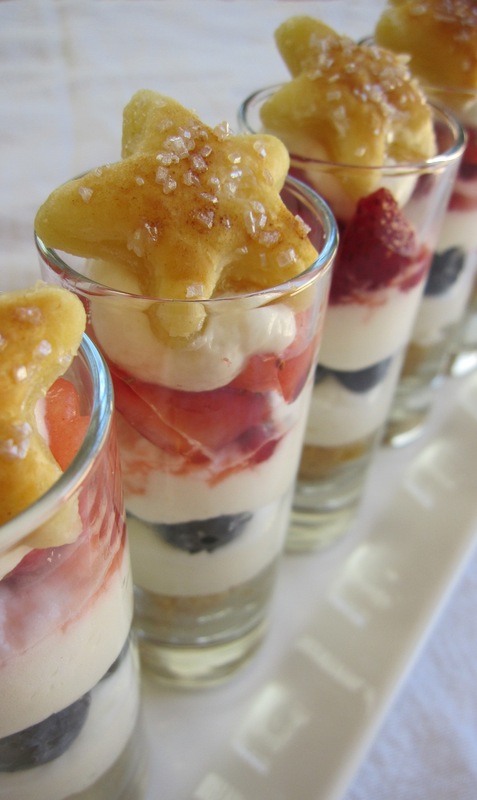 If desired, decorate each trifle with a puff pastry star (recipe follows). Cut out stars from puff pastry sheet using a star cookie cutter. Transfer pastry stars to a non-stick cookie sheet. Brush each star with a little melted butter. Sprinkle top of each star with sparkling sugar. Bake for about 10 minutes or until puffed and golden brown. NOTE: I also bake the little scraps of leftover puff pastry dough. After cutting out the stars, I take the little leftover scraps and lay them on another cookie sheet. Brush the scraps with melted butter and sprinkle regular sugar on them, then bake them together with the stars. Hand them out to the kids to snack on and voila! Nothing wasted at my house!